Interestingly enough, even though I ran with 5 Garmins, only one made the top three. 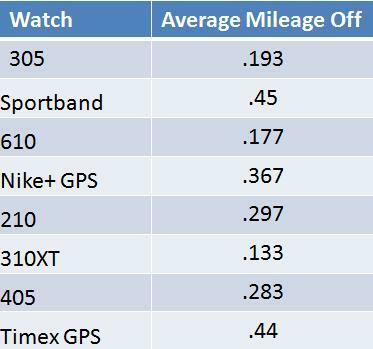 Another surprise is that the 305 and the Timex both measure less than the actual distance while all the others (disregarding the Sportband) measure farther. 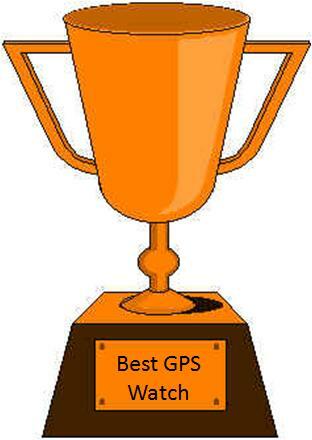 The reason GPS watches have such a hard time with distance on the track is the constant turning. Because the watch gets signals from the satellites every 3-6 seconds, the watch connects the points linearly instead of on a curve. When you think about it logically, however, the GPS path should be shorter instead of longer. It could be that the watch is trying to accommodate for the curve and adding extra distance, or it could be that people actually don't run on the 400m section of the track, they could waver a little bit and go into other lanes or not take the innermost section of the track. 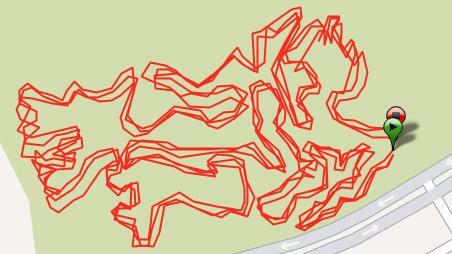 Looks like Garmin dominated this run. 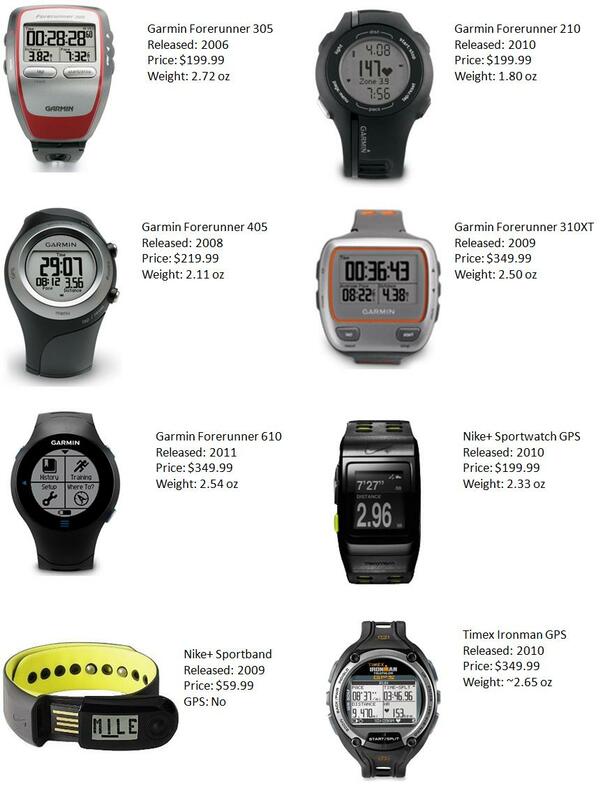 The Nike+ GPS and Timex GPS really were nowhere to be seen. Both had very poor performance pretty much from the beginning. For the second run in a row, the "old school" Garmin 305 has placed in the top 3, which for me is surprising. But without a doubt, none of the watches could even compare to the 310XT, so trail runners, go pick it up and hit the trails. This was the first test that the 305 wasn't in the top 3, but it definitely was right there with them. This test is the most fair of all the tests since it was run in open air with nothing to interfere with the signal. In the end, all Garmin's seemed to be the best. 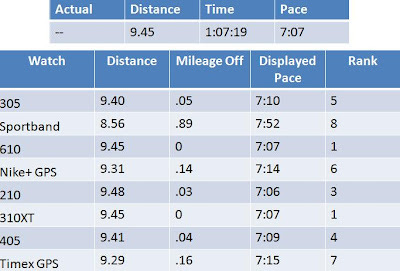 But the hands down winner for most accurate is the 310XT with an average of .13 miles off for 3 runs totaling 20.05 miles. 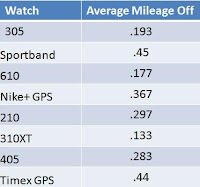 The least accurate GPS watch was the Timex Ironman GPS with an average of .44 miles off. Well that wraps that up! I hope you found this review helpful and enjoyed The Life of a Runner. You realize your distance you ran on the track (6*800+6*400) is 7200 meters? A 400 meter lap is not a quarter mile, it's a little less. So the actual distance was 4.47 miles. Actually a track is measured 20 cm (roughly 10 in) out from the inside line. This is roughly where they figure the average runner will run. Close to the inside edge but not all the way on the inside. 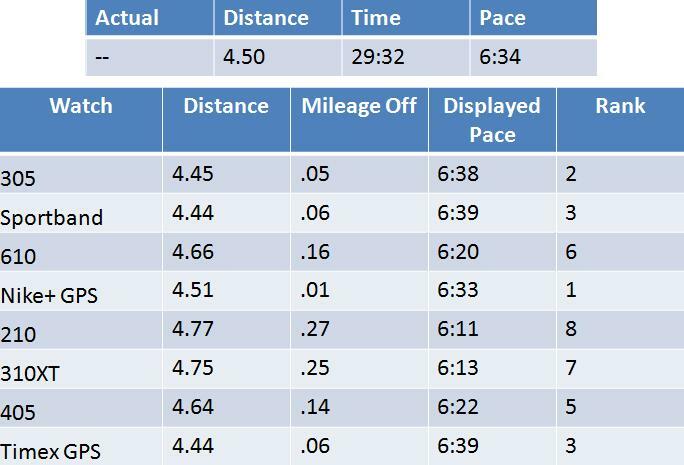 Heathur is correct the distance on the track should be 4.47 mi. 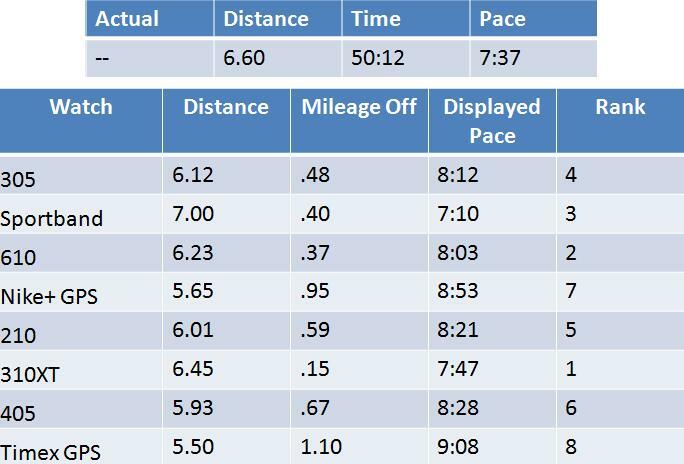 How did you determine the "actual" distance on the trail and road? Unless you used a calibrated wheel your "actual" is likely no more accurate than your GPS measurements. Please don't tell me you drove the road route with your car or mapped it online. Don't get me wrong, this was still a cool comparison of the different models since they all traveled the same route but the only test that says much about absolute accuracy was the track. Also withy the Garmin 405, did you enable 1sec recording by pairing it with an Ant+ power meter first? And did you set the 305 and 610 for 1sec recording? It would be interesting to see how repeatable the results are. Did you use the shoe pod w/ the Nike+ GPS watch as well or just the satellite? Nice job on the comparison tests. I've run with the Garmin 305 for years. It's very accurate and a terrific value for the money. If you tested them as you are wearing them in the picture, the units on your left arm traveled a shorter distance on the track than those on your right. That figure could be significant, considering the width of your body and the number of laps run. 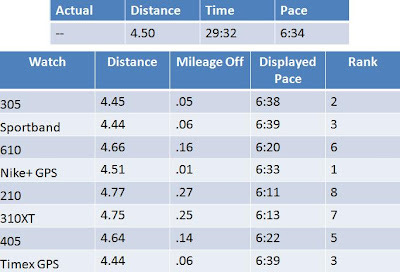 For the trail loop test, it is not valid so stated how far each unit was "off", since you have no accurately measured and strictly run course. 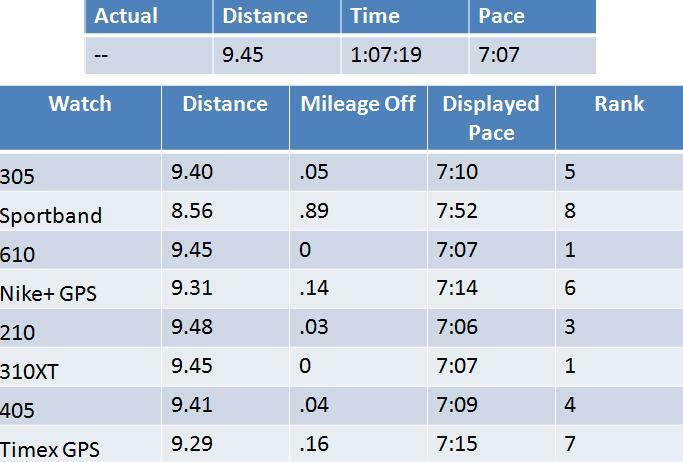 Even if you have a wheeled measurement of the course, unless you ran in exactly the same foot step on every loop, you are the variable in exactly how far the trail measures. Finally, the same problem applies to your road loop. 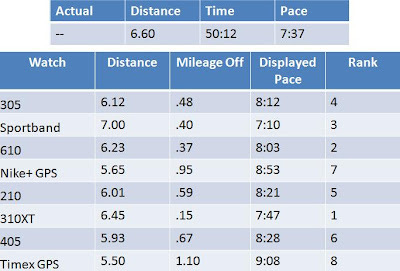 It is interesting to compare the GPS units to each other, but which one is giving you the proper distance? You have no way of knowing unless all of those units were strapped to a measuring wheel to compare the measured distance to the GPS reported distance. 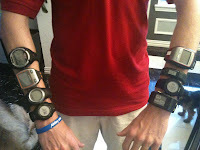 I bet you got lots of stares running around with all those watches. I wonder how an iPhone using the Runkeeper app would stack up... I have a garmin 405 but i usually use the iPhone to track my runs cause it's with me all the time. Foregoing criticism aside, this was a great test -- thanks for doing it! Great test and great post. 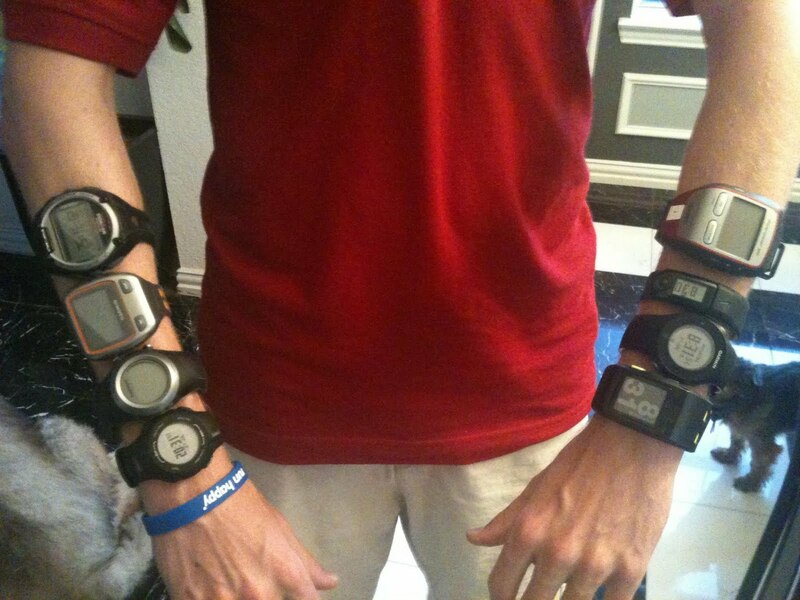 A lot of the people who are commenting are just trying to show how smart they are - but did any of them test all these different gps watches and blog about the results? This is been a good post that i have ever seen. it is amazing. Use of a GPS gadget is anyplace .You can see it mounted on planes and boats littler watercraft's, autos, and a wide range of moving vehicle.